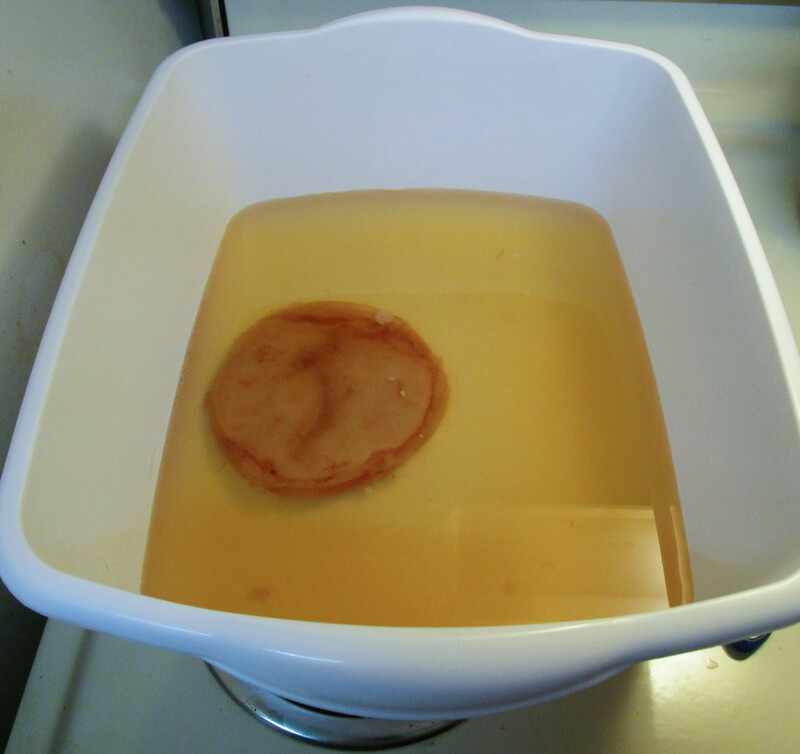 The primary ingredient in the recipe is a live kombucha culture, which I had never heard of. According to a whole five minutes of painstaking research on the internet, kombucha is normally used to make a weird drink that will either make you immortal or kill you. You can buy cultures on Amazon meant for brewing the kill-or-cure beverage. 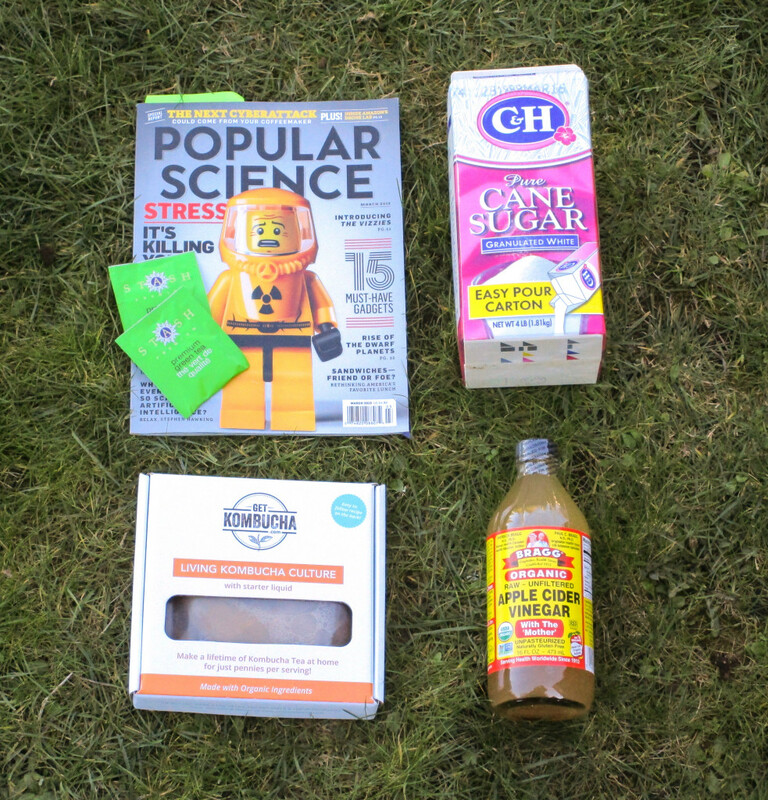 The other ingredients are green tea, water, sugar, and organic cider vinegar. I know exactly how you feel, Lego dude. The article only gave the bare minimum of instructions, and for some reason they gave the ingredient measurements in stuff like milliliters and grams. I guess they assume you’ll be doing this in a lab instead of a kitchen? My uncle, who is not afraid of numbers, helped me convert some volumes, and I had to experiment to get the rest. According to my postal scale, seven ounces of sugar equals EXACTLY one cup. Thanks for making it easy, Pop Sci! Yum! Just like Momma used to make. We named him Phlegmy. In about four weeks this will have formed a leather-like skin that—when dried—can be dyed and sewn just like any other fabric, assuming I did it right. (And why would you assume that? Are you new here?) I’ll post updates if it starts to do anything interesting. This entry was posted in Current Projects and tagged experiment, fabric on March 9, 2015 by Skirkbucket. Tim wanted a box to keep monster stat cards in when he is dungeon master-ing, so this was my Valentine’s Day present to him. 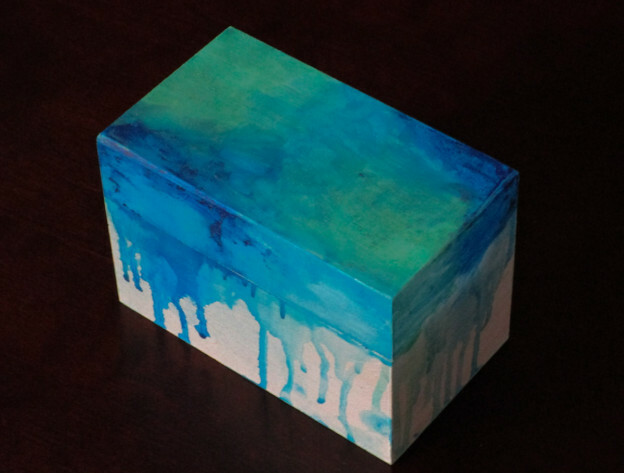 I covered a wooden box I found at a craft store in gesso and rubbed Gelatos (watercolor pigment sticks) all over the top and sides of the lid. A generous spritz of water, some smearing with my fingers to blend the colors, time to drip, and it was done. Well, pretty much done. I did have to add more pigment after I added the water, but otherwise it was a very straightforward process. Except I had to keep coming back to it as it dried to encourage the drippage. Oh, and I put on a coat of fixative. And it needed to be blessed by a wise old hermit that lives in a cave that can only be reached by pogo-stick. But other than that this was a non-fussy project. I love the way this drip technique highlights the rough areas of the gesso. (I’m choosing to embrace this as “much-needed texture” as opposed to “sloppy brush strokes.”) This was my first project with Gelatos, and I will definitely be using them again. My only complaint is that the paint sticks don’t taste like ice cream. I consider this false advertising and will be contacting my lawyer. Pro tip: Always make sure any art supply you invent is tasty. We are “starving artists,” after all. This entry was posted in Current Projects and tagged experiment, supplies on February 26, 2015 by Skirkbucket.